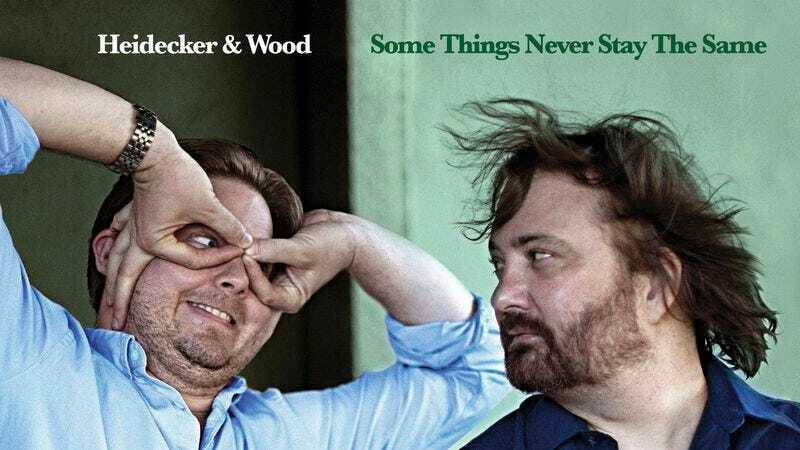 Tim & Eric's Tim Heidecker and that show’s composer, Davin Wood, first collaborated as Heidecker & Wood on Starting From Nowhere, an album inspired by 1970s rock songwriters like Warren Zevon, Harry Nilsson, and Boz Scaggs. Since then, Heidecker has released a parody jingle for a Herman Cain compilation, dropped by the home studio of Chicago’s The Earth Is A Man to record an impromptu cover of Bob Dylan’s “All The Tired Horses” to go along with other Dylan spoofs like his Titanic song, and even released a tune about drinking his own urine. But now Heidecker & Woods are reunited for a follow-up, Some Things Never Stay The Same, out November 12 via Little Record Company. The album features guest appearances by Aimee Mann on two tracks, Eric Johnson of The Shins, Jason Boesel, Mike Green, and Rilo Kiley’s Pierre de Reeder and Mike Bloom. Here’s a video of the live debut of the first track, “Cocaine,” recorded a few years ago at L.A.'s the Largo.